WASHINGTON – With a deadline looming for a federal program to give free meals to all students in certain low-income schools, some Arizona districts are finding there really is no such thing as a free lunch. State officials by Friday had approved just 29 of the 247 school districts and charter schools eligible for a program to provide free breakfast and lunch to any student at those schools, regardless of the student’s income. Sunday is the deadline to apply. But while the poorest districts would be fully reimbursed by the federal government, others are note even applying because they would have to pick up some of the cost. Under the Community Eligibility Provision, schools where at least 40 percent of students qualify for free or reduced-price meals could offer free meals – breakfasts and lunches – to all the students in the school. The program, part of the Hunger-Free Kids Act of 2010, had been offered in 10 states and the District of Columbia but is being expanded nationwide this year. Participating schools are reimbursed by the federal government up to 100 percent of the cost of meals, under a formula that multiplies the school’s percentage of low-income kids by 1.6. So schools where 62.5 percent of students or more are low-income would be fully reimbursed; between 40 and 62.5 percent, the school has to pick up some of the tab. The program is not mandatory, state school officials said, and the decision to join has been a difficult one for some districts. Arizona is not alone. Segal said that, across the nation, some eligible schools are hesitant to participate because the program may not be financially viable for them. But for those schools at the full-reimbursement level, opting in should be a “no-brainer,” Segal said. For Concho Elementary School in Apache County, the decision was an easy one: With a low-income student population of about 73 percent, the school district will be fully reimbursed. Billie Bell, business manager for the Concho Elementary School District, said 86 percent of the school’s students got free or reduced-priced meals last year, but even that was a burden for some families. The numbers didn’t work for Creighton Elementary School District, said Linda Daugherty, director of food services for the Phoenix district. Four of the district’s eight schools are eligible for the program, but the low-income student population for each of those schools is below 50 percent. Szafranski said there are many benefits for districts that can make the numbers work: healthier students, less paperwork for administrators and the potential for greater academic success. Once a school has applied, it takes about a week to get state approval, Szafranski said. 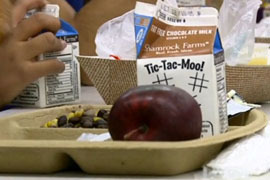 Schools can start serving meals as soon as they are approved. The 29 approvals granted as of Friday represent 67 different schools around the state. Szafranski said the state will continue to work with schools to identify barriers to participation and help them work through any challenges. 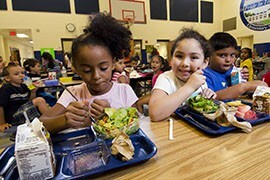 Manassas, Va., grade school students eat lunches that meet federal nutrition standards in this 2012 photo. 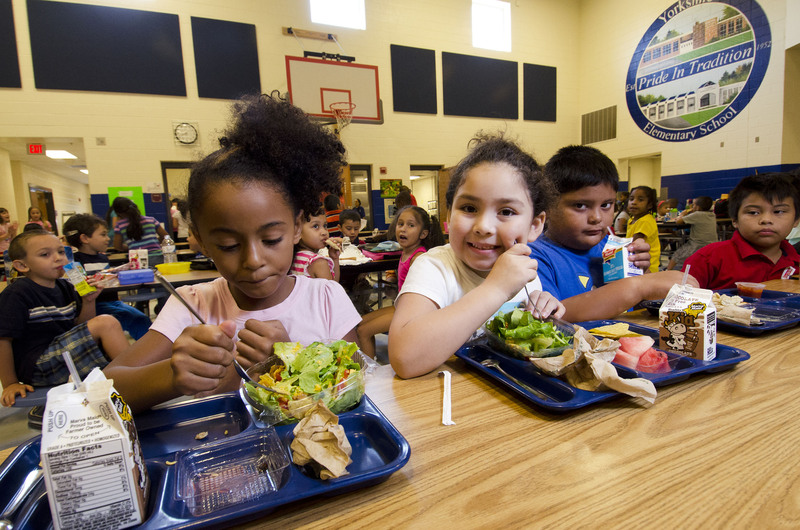 The U.S. Department of Agriculture is expanding its free school lunch and breakfast program, but not all eligible Arizona schools plan to enroll. Many low-income children can get free or reduced-price breakfasts and lunches at school, but a new federal program would make the meals free for all students at some schools with a certain threshold of poor students.